We don’t have much going on right now – we ordered a bunch of seeds for the garden and greenhouse and are working to get everything planted in the next week or two. We’re a bit behind schedule, but there is plenty of growing season left in zone 8. The greenhouse was completely infested with ants, and I’m struggling to get them out of there without killing any of the plants. We’re still trying to make a decision on whether to keep or sell the boat. I fixed the trailer, got it inspected, and renewed the registration on it. We’ll launch it a few times and see how we feel about it – but it runs a few thousand dollars a year to store and maintain, and is worth a lot — so I figure if we’re not taking it out 30 days a year, then it isn’t worth keeping. The RV has a leaking hydraulic ram, so I’m a little hesitant to take out on vacation. It is covered under warranty so I’ve been trying to get someone out to take a look at it, but all the RV shops are backed up for spring. If I can’t get someone out in the next week or so, I’m going to pull the ram myself and take it to a hydraulic shop so that hopefully someone can match up the proper seals. Lippert doesn’t sell reseal kits, and replacing the whole ram is both unnecessary and expensive. Speaking of, a lot of maintenance on my truck is coming due. I don’t put enough miles on my truck to hit the scheduled intervals before a year runs out, but change most filters and fluids annually in April. It’s relatively expensive to do that on a modern diesel, especially if you buy quality components and synthetic fluids. It’ll run $200+ to do this. We just replaced all the rotted soffits around the house and hired painters to cover the whole exterior with fresh paint. We chose a nice green-grey for the main body and a dark green for the trim, which contrasts nicely with the red-orange brick. We’re happy with the results. Whether we put this house on the market, or stay in it for another five years, it adds value either way. Regarding other projects, it’s strange to have moved on to where I’m not looking for things to do. 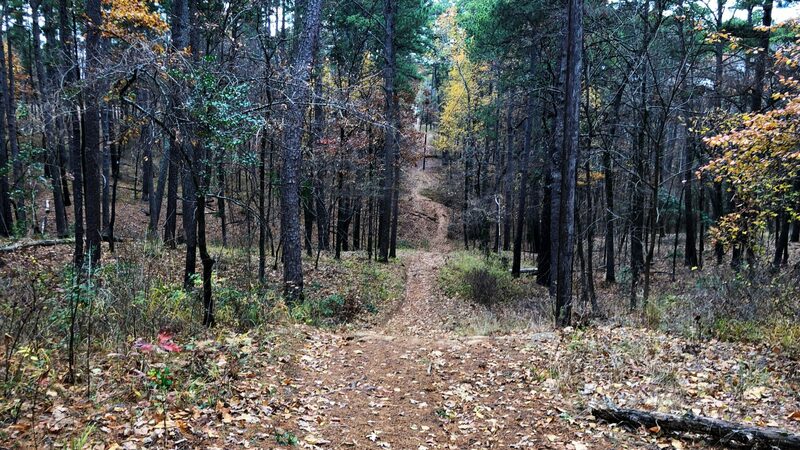 Running takes up a lot of my time and has changed my priorities – I’m not constantly wanting to tinker with new things, build project cars, boats, and various contraptions anymore. If anything, I’m looking to get rid of a lot of those things so I can travel and run new places, with less responsibility. We’ve been working on rebuilding all the colocation and getting contractors up to speed. Everything is up and online in the new facility, and we’re paying two facility bills for the time being – ouch. In the next few months we’re going to phase out the old one, and in the end, we’ll save quite a bit of money in our monthly expenditures for the business. At the same time, we’ll have gained a lot of fault tolerance – which is what we were wanting to accomplish with this move. Having a capable contractor, and actual documentation to give them, is working out great and has made this a lot easier. I’m averaging around 36 miles per week now, with a long run on Saturday that accounts for nearly half of the total volume. A typical week might be six miles on Sunday, rest on Monday, four miles on Tuesday, seven higher intensity miles on Wednesday, walk or cycle on Thursday, four miles on Friday, and 15 miles on Saturday. That means I’m burning over four thousand calories a week in addition my BMR and daily activity. I picked up a new pair of running shoes a few weeks ago, Altra Escalante 1.5s, and just passed 110 miles on them. Shoes are good for 300-500 miles, so I’m currently looking at a couple months per pair if they begin to show much wear on the low side of that. At my goal mileage, I’ll go through a pair almost every month on the same metric – but it will take a while longer to get there. A local guy on Strava consistently covers a hundred miles a week, but I’m realistically only reaching for 60. We discovered an electrolyte supplement you add to water called Nuun while at the running store (I actually bought the shoes in person). I planned to use it when on my long runs, but found that it’s effervescent and flavorful, and as such it’s become a staple in our daily diet – replacing soda. That is not what it is marketed for, but if you ever see it in stores, you should try it. My favorite flavor is the tropical. We buy it in bulk on Amazon – it’s a bit cheaper than on Nuun’s website. Kelly has been doing structured training on Zwift, following their 13-week Build Me Up program. She also manages to work in runs with me on Tuesday, Friday, and sometimes Sunday if she can without overextending herself. She ran her first 10K recently, and is going to begin working on distance with me. A little while back, we upgraded her trainer to a Tacx Neo, which was quite an expense but seemingly worth it since she spends several hours a week on it. She says it is a humongous improvement over her CycleOps Magnus M2. With all the extra calories burned, we continue to track our calories in Cronometer to make sure we’re getting the right amount of calories and the appropriate vitamins, minerals, and macro/micronutrients. Most of our staple meals come from NoMeatAthlete – though we have a lot of our own recipes, some from other websites and cookbooks mixed in, and we occasionally eat customized Taco Bell menu items and takeout Chinese food (sesame tofu is amazing – think Sesame chicken, but without the gristle and questionable sourcing). Most of our food is made from fresh fruits and vegetables, various breads, beans, grains, nuts, seeds, and even algaes. It’s amazing how much variety you have when you stop looking at the same three main ingredients for your meals, and draw culinary inspiration from other cultures. Our grocery budget for two adults in Austin runs around $75/week, not including a dinner or two that might be takeout. To save time, we use HEB’s shopping service (a $5 fee) and pick up at the store – they bring the items out to your car. They used to call or text to confirm that we really want six or seven bunches of bananas, and not just a bunch of six or seven, but I guess finally made a note for us. One of my friends ordered a cheeseless pizza today from Dominos, according to my recommendation. We have started making pizza at home when we want it, but for a while were ordering modified Pacific Veggie pizzas without cheese and extra vegetables. 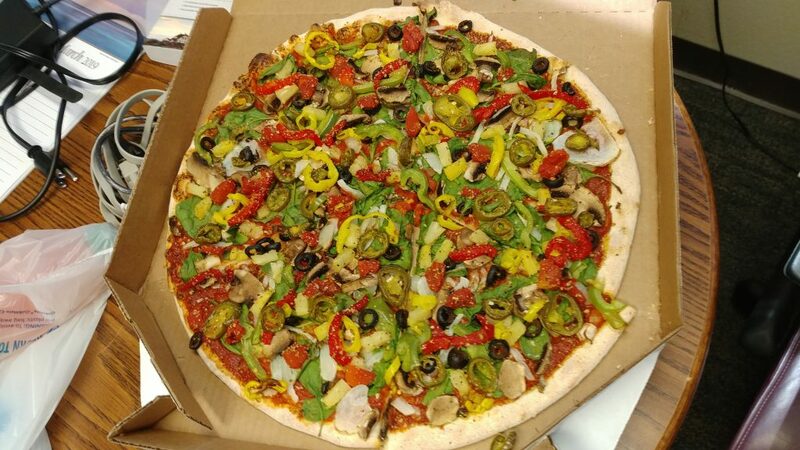 He sent me this photo with the caption, “this is one of the best pizzas I’ve ever had and SO many veggies”. Try it some time – Pacific Veggie, remove all the cheese, add all or most of the veggies. I might have to order one or two this weekend. I’ve had a bad experience with their spinach, so usually leave that off. As a bonus, if you’re looking for a lower calorie pizza, removing the cheese removes a lot of the calories and if you’re looking for a healthier option, a lot of the health concerns. The downside is if I order them on a Saturday, I need two medium thin crusts just to cover the calories I burn on my long runs. While we spend a lot of time running and cycling, neither of us have been that great about recovery. Especially with running, my muscles and joints tend to take a beating and are still adapting. Foam rolling is the recommended solution – but it’s almost a workout in itself. I’m lazy when it comes to recovery. To address this, we purchased a Roll Recovery R8 which has been wonderful, but when I found my HSA (which is corporate funded annually to offset my insurance deductibles), covers devices like the Air Relax Recovery System, I decided to order a set of those as well. The downside to using the HSA is if we do incur deductibles later in the year, we’ll actually have to pay them out of pocket. The Air Relax system is basically an inflatable pair of pants, and an inflatable pair of shorts (optional, but we ordered both – the shorts cover your hips and lower back) that selectively pressurize and release compartments as you wear them. The air pressure essentially acts as a sports massage, and can help work the lactic acid out of your muscles and increase bloodflow. I’ve noticed a fairly big difference using them, and am making a habit of it. There are a few different modes and intensities to choose from, and I vary through them quite a bit but tend to use mode C, which is constant compression of all chambers, at the third intensity level, the most. From what I’ve read, a lot of local running stores carry and allow you to demo them, so if you think you could use such a thing, you should stop by one and see if you can try them out. We recently started rewatching HBO’s The Wire. We very rarely rewatch anything, but there are three series – coincidentally all starting with The — The Wire, The Killing (American version), and The Bridge (Swedish/Danish version) — that we consider worth (several) rewatches. I highly suggest seeking these out if you haven’t seen them.